Taking a good care of your motorcycle is as important as taking a good care of your car. You need to maintain it on a regular basis and protect it the right way if you want it to run properly and to keep you safe when on the road. When speaking about protection, choosing the right motorcycle cover is of vital importance for keeping it in a good condition, and since they come in different types, sizes and shapes, sometimes it can be pretty hard to know which one is the best for your motorbike. That being said, let’s see what are the most important things you need to consider in order to keep your motorbike safe and sound. The first thing you need to consider before making a purchase is whether you need an indoor or outdoor motorcycle cover. Whether indoor or outdoor motorcycle cover what you should need to know first is that a great motorcycle cover should be able to keep your motorbike clean, to diminish rust and paint fading, and to protect it from the weather. 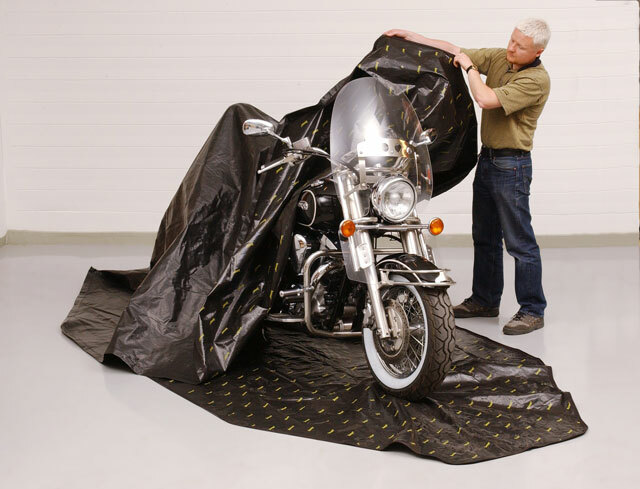 If you have the luck to have a garage to store your motorbike indoors, then a simple motorcycle dust cover would be just fine, and if you don’t have the luxury to keep it indoors, then a heavy-duty outdoor waterproof cover is recommended to protect your bike from the weather elements. Just keep in mind that the motorcycle should be also breathable, especially for long-term storage as that way air can flow freely, preventing the motorbike from rust, mould, mildew and water. Although motorcycle covers are usually made to fit motorbikes of different sizes, some of them are made to fit specific models. And since it is always better to check twice before you make any decision, it is recommended to measure your bike and to check on the chosen cover’s size. In the end, it is better to choose a bigger cover than a smaller one, right?! In case you decide to choose one size motorcycle cover, double check the maximum size to calculate if it will fit on your bike or not and the best way to do that is by measuring the bike’s length and height. Last but not least, when choosing the right motorcycle cover you should also think about the material as there are many on the market that vary in thickness and protection. Generally speaking, those covers that are made of higher quality are more costly and the main difference between the more affordable and the more costly ones is in the weight of the materials hence the fabric. The quality ones are usually made out of lightweight waterproof polyester material that can provide maximum resistance to rainfall or snow while the other options are also thicker but more heavier and difficult to put on and take out. This entry was posted in Automotive and tagged motorcycle accesories, motorcycles by australiaonline. Bookmark the permalink.